When setting up a greenhouse, one of the most important aspects of the construction process is the foundation. 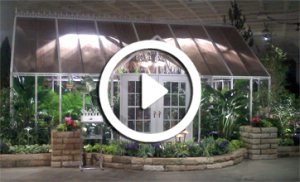 There are a few different types of foundations that can be used for greenhouses. The foundation used will be determined by the type of greenhouse, the building codes, and, in some cases, personal preference. Essentially, the foundation is the complete system on which the greenhouse structure sits. One of the key components of a foundation is the footing. The footing refers to the point at which the structure meets the soil. This is the section that the structure rests upon. Footers are not always necessary for a standard hobby greenhouse. In situations where they are necessary, footers are typically poured concrete and their exact depth is determined by local building codes and the location’s frost levels. Footers help to prevent sagging or movement of the structure’s walls. The choices for a greenhouse’s foundation are typically dependent on the type of greenhouse structure that will be built. If you have an attached even-span or a lean-to greenhouse there will be the need for footers with the foundation. Local building codes will determine the exact depth needed for the footers. Basically, attached greenhouses require frost free footers that will not shift or move. As the ground freezes and thaws, structures without the proper foundation could move or sag. If you plan on building an attached greenhouse, you should also plan on a more extensive foundation. In most cases, the gardener is already planning on the expense of a foundation for the attached greenhouse so the cost of pouring a concrete pad for the floor is seen as a minimal addition. However, some gardeners still prefer the extra humidity and moist, earthy smell of a natural base, so they will have a gravel floor installed. We recommend using limestone gravel (because of its alkalinity) with a weed barrier placed beneath the gravel to help prevent weeds from growing in the ground. Some gardeners prefer a gravel floor for its natural drainage properties as well. Regardless of the floor material chosen, the footing requirements will not change. Smaller, freestanding greenhouses do not have the same requirements as an attached greenhouse and, therefore, give the grower more options when it comes to the foundation and floor. Freestanding greenhouses can have a concrete slab poured without a deep foundation. In fact, if the greenhouse doesn’t have a knee wall, it can be placed directly on a cement slab or it can be placed on a 4’ x 6” treated lumber base. A wooden base can be anchored into the ground with three foot lengths of rebar. 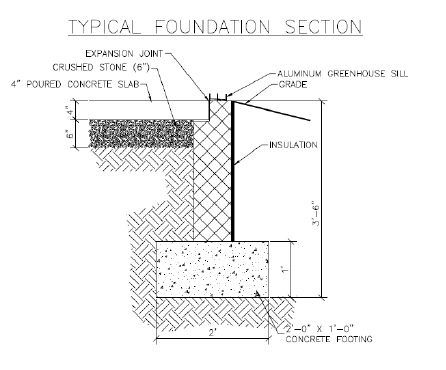 For a freestanding greenhouse with a knee wall (a brick or cinder block wall that stands roughly knee high), a 12” x 12” surface footer is required to support the weight of the knee wall and prevent cracking of the cement pad. Knee walls are usually installed to add design appeal and for their natural high thermal mass. During the day, the stones absorb heat from the sun and during the night, they act as a passive heater as the heat is released into the greenhouse. 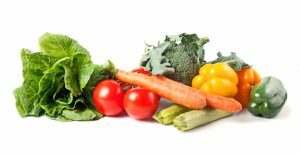 Generally speaking, greenhouses that are attached to the home, or freestanding greenhouses that are more than 120 square feet, will need zoning and building permits. However, it is always a good idea to check the local city codes to see what permits and footings are required before beginning construction on any greenhouse.